MYTHS and LEGENDS: The art image for today's legend shows The Flight of Aeneas, and there are more images here. ERASMUS' ANIMALS: Today's animal proverb from Erasmus is Ars multa vulpi, ast una echino maxima (English: The fox has many a trick, but the hedgehog has just one big trick; from Adagia 1.5.18; see Wikipedia for more about this proverbial animal pair). 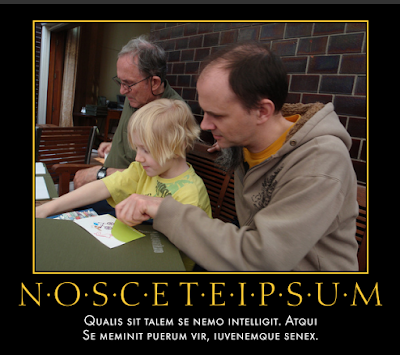 BREVISSIMA: The distich poster for today is Nosce Teipsum. Click here for a full-sized view. Libros lege; quae legeris, memento. Read books; what you read, remember. 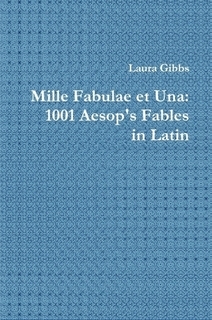 PHAEDRI FABULAE: The illustrated fable from Phaedrus for today is Pavo ad Iunonem, a story about being who you are, and not someone else: Latin text and Smart's translation. STEINHOWEL: The illustrated fable from Steinhowel for today is De leone et pastore , a story often known by the title of Androcles and the Lion: Latin text and English versions.